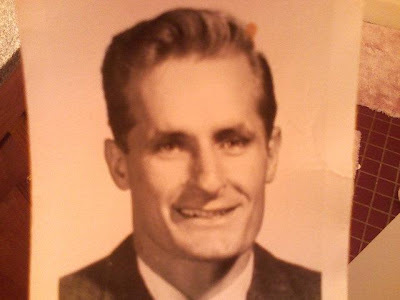 My Grandpa Krainock passed away on Thursday. I am just relieved that he will no longer have to suffer. It's been so tough on everyone, to watch him slowly slip away. It's been toughest on Grandma. I love you Grandpa- so much, I am happy you are in a better place now. I've been in a blue-funk for the past couple of days. But it's time to get out and live life to the fullest. I know that's what he would want! So I am going to put a smile on my face, kiss the one's I love. And start becoming more "other-centered"- meaning, helping out my family, especially my Dad- for the wonderful man he is. AbcGrrrL is having her first giveaway!! yayy for giveaways! I have been lemming to get my hands on PINK FISH from MAC's Hello Kitty Collection! Hope everyone is having a safe and fun memorial weekend. im sorry to hear about your loss & will keep you and your family in my prayers. Rest peacefully, Grandpa Krainock, your memory will always be remembered. I'm so sorry to hear.. Rest in piece, gpa Krainock. I'm glad you're staying positive and staying strong. I'm sure he still loves seeing your beautiful smile up there. i absolutely salute you for the way you have dealt and are dealing with the death. you are so, so strong. I'm so sorry for your loss! He is home now and can rest. May your memories together make you stronger babe! Im sorry for your loss Whit. Hes at a much better place now. I'm really sorry about your loss Whit. Hope you and the family are staying strong. Take care. I'm so sorry for your loss. You are so stong! thanks for all of the love ladies. so sorry for your loss... stay strong! My deepest condolences, Whit. I am sure he is very happy now with our creator. oh i must of read wrong.. its your grandpa.. sorry hun! xoxo we're here for you!!!!!! I'm so sorry about your grandpa. May he rest in peace. I'm so sorry to hear about your grandpa. I'm glad he's no longer suffering, at least he gave you lots of wonderful memories before he passed on, i never knew mine. our thoughts are with you whit. be strong. I am sorry for your loss. I know how it feels, but at least you have good memories of him. Take care! I am so sorry to hear that. But I am sure that for him it was the best. Even though it is hard for your family and especially for your grandma it means no more suffering for him. Keep the good memories of him in your heart. Three years ago I lost my grandpa. His suffering lastet over a year and then came to an end so fast that I didn't even have a chance to say bye because he lived about 400 km away from where I live. Just want to send my condolences to you & your family. Take care, beautiful ! I'm sorry for your loss but he is in a better place. Keep that head up and show the fam bam that your strong. God Bless. Ohh... best wishes to you and your family in this difficult time. So sorry about your loss Whit...condolences to you and your family. My deepest sympathies and condolences to you & your family. Like you said, at least he is no longer suffering... and he will forever live on in your hearts. I'm sorry to hear about your loss girl, my grandmother passed away too and it was seriously hard for our family, especially my dad. Stay strong & I hope everything goes well! Thanks for the birthday wishes, you're such a doll, keep your head up high! I'm sorry about this, Whitney. I hope your family recovers from this loss. Keep up your smiles, you're such a beautiful and gifted person. my prayers go out to you and ur family. I'm so sorry for you loss :( Please feel better soon! so sorry to hear about your loss. may your grandpa krainock rest in peace. I am soooo sorry to hear about your loss. I will definitely be keeping you and your family in my prayers. May God bless and guide your family through this trying time.